Cleveland Browns quarterback Tyrod Taylor (5) looks for a receiver during an exhibition game against the New York Giants on Thursday. Despite a good performance by Baker Mayfield, Browns quarterbacks coach Ken Zampese says Taylor will remain the starter. BEREA (AP) — He’s still Baker the backup. Despite rookie Baker Mayfield’s stellar performance in his NFL preseason debut, the Cleveland Browns are not moving the No. 1 overall pick into the starting lineup ahead of Tyrod Taylor. Mayfield won over some doubters on Thursday night in a 20-10 win over the New York Giants. The Heisman Trophy winner from Oklahoma threw two touchdown passes to tight end David Njoku and showed pocket poise and awareness while completing 11 of 20 passes for 212 yards. The reviews on Mayfield were beyond exceptional, leading to cries that he should jump Taylor, who went 5 for 5 for 99 yards and posted a perfect 158.3 rating during his two series. Zampese was pleased with everything he saw from Mayfield, but he cautioned against putting too much into his first taste of pro football. The feeling is the same about Taylor, who was acquired from Buffalo during the offseason. The 29-year-old has been everything the Browns could have hoped as a leader and mentor to Mayfield. Zampese, who previously worked as Cincinnati’s quarterbacks coach and offensive coordinator, gushed when describing what Taylor has brought to the Browns — and what he means to Mayfield. During his interview session, Zampese bristled at the idea that Taylor was just holding a spot until Mayfield is ready. 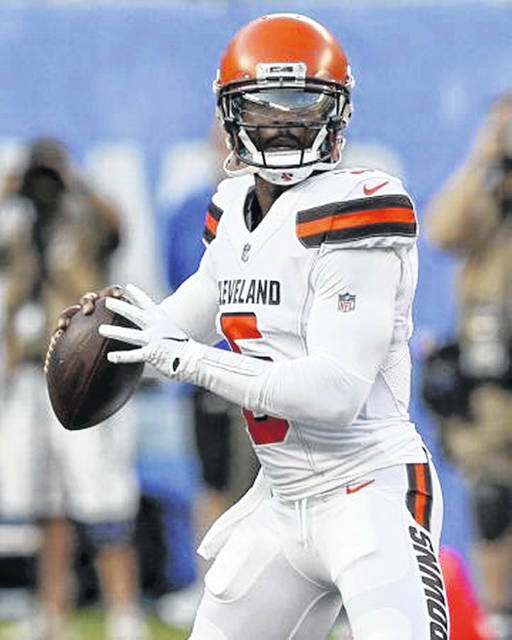 https://www.limaohio.com/wp-content/uploads/sites/54/2018/08/web1_Tyrod.jpgCleveland Browns quarterback Tyrod Taylor (5) looks for a receiver during an exhibition game against the New York Giants on Thursday. Despite a good performance by Baker Mayfield, Browns quarterbacks coach Ken Zampese says Taylor will remain the starter.